underskriftsindsamling: Vote Kaleem Caire for MMSD School Board! Vote Kaleem Caire for MMSD School Board! 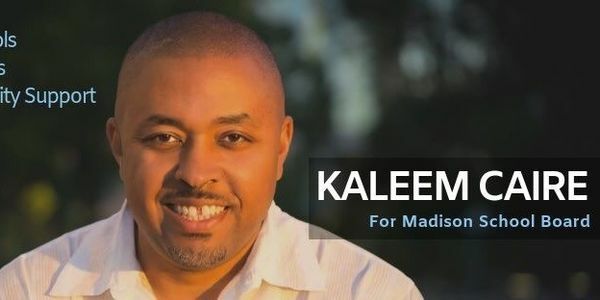 We are supporting Kaleem Caire for the Madison School Board. Kaleem knows Madison. He graduated from West High School and was raised on Madison’s south side near the Boys and Girls Club. He has a daughter currently at West and a son at Jefferson Middle School. He has a bachelor’s degree in education from UW-Madison. His No. 1 commitment has always been to ensure the best educational opportunities for our youth. Kaleem recognizes that MMSD’s current curriculum and test-heavy approach is not preparing young people for the 21st century. He wants to de-emphasize the intense focus on testing to allow more room for innovation and creativity in the classroom. He is a strong supporter of teachers, believing they need to be able to use their professional expertise, with appropriate support and coaching when needed, to try different strategies to reach all students.